will introduce you, one step at a time, to your miraculous inner intelligence. • Do you wonder where you are going and why so fast? • Are you aware of what will sustain you when all else fails? • Do you long to participate more vibrantly and enthusiastically in your life? Join author Susan McNeal Velasquez as she takes you beyond the insights you've already known, into a world where you will learn to link your intellect's passion with your heart's knowledge, to activate your intuitive wisdom. You are in expert hands. Velasquez has written and facilitated personal development seminars for over three decades. Her clients include highly successful professionals from all walks of life - all of them searching, despite outer success, for a deeper, richer connection to the pulsating rhythms of a more meaning filled life. Beyond Intellect, there is a vast storehouse of wisdom that beckons you to: < Open your mind. < Soften your heart. < Deepen your awareness. < Strengthen your resolve to thrive rather than merely survive. If you want to learn to use the intuitive gifts you were born with to live a richer life, read Susan Velasquez's book. This is not a typical "new age" book on intuition; it is intended for those of us who live mostly by thinking and are not completely happy with the results. She guides us through a journey of rediscovery, and inspires us to recapture the joy and energy we've lost. Her book is tightly written, engaging and challenging. Definitely worth reading! 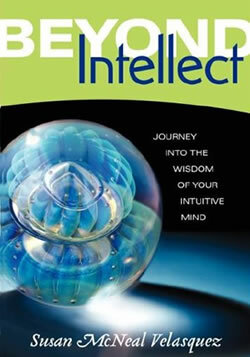 Beyond Intellect is an invitation to dare to live more purposely and fully than your present day existence. Susan gently guides your unacknowledged self into the light of acceptance. I find Beyond Intellect speaks to me and my friends as 20-somethings, and is just the sort of gentle guidance to assist us in living deep and enriching lives. Life can get crazy sometimes, but it is nice to be able to take Susan's suggestion and 'hold the book between your two hands. Ask this question: What specifically do I need to know at this time?" She is correct, and Beyond Intellect provides the impetus for the answers I need- whether the thought provoking questions within the text, or just a moment for me to stop and listen. I've taken Susan's class and now I've read her book. Each day I live what Susan has taught in her book. I've opened my life up to living my dreams and creating the woman I always knew I was. My life is full of delight and I'm able to appreciate the ease in which my desires come to life. When I have a question and need an answer I just open her book and reread what the book has to say to me. Not only is my question answered but I'm also filled with inspiration and an ability to feel comfortable with my own answers to life and putting them into practice. I was a person with no boundaries and various active addictions. Today, I am able to make sound choices for myself and live a pretty balanced life. I attribute this greatly to reading and implementing what Susan has written in her book. Reading Susan's book is a must if you want to really start living and enjoying your life. I am a living example of Susan's work. This book should be left on the table and never put on the shelf out of reach! I have always known that our thoughts influenced all aspects of our lives but this book has provided clearly written directions for our innermost soul to develop and thrive. By opening up the book to any given page therein lies the answer to any question. Outstanding! I bought this book for all of my friends who are either writers and/or interested in spiritual growth. You can read it from page one or use it as daily guide as to what is going on with you and your path. Susan is a true goddess who shares spirituality in a way that not only appeals to your mind but also to your heart. I highly recommend it. Wonderful Book - A Must Read! This book is really well written and thought provocative. The Author did a nice job of couching the subject matter and it was very interesting through the end of the book. I suggest this is a "Must Read"
Susan has a way of using the written word in gentle, but rapier-like fashion which bares the human spirit to amazing personal insights. Her book is a treasure to revisit again and again for understanding, inspiration and comfort as we travel our unique life journeys.